FLAT-PAK products are high performance application-specific A/V, recording and broadcast modules constructed in compact, low-profile, shielded heavy duty metal chassis'. Module functions include pre-amplification, format conversion, line driving, power amplification, mixing, distribution, equalization, level control and more. The unique FLAT-PAK case can be directly screwed or bolted to cabinets or shelves. Rack mounting accessories permit mounting single or multiple FLAT-PAKs to front or rear rails. Adjacent mounting of FLAT-PAK modules is facilitated by daisy-chaining multiple modules from a single power supply using included power interconnect cables. FLAT-PAK modules provide the most common connections in professional installations, including gold-plated jacks, detachable and fixed terminal blocks. Bold, high contrast labeling facilitates connection and adjustment in confined or dark locations. LED metering and indicators shorten setup and adjustment time. Signal connectors and switches are very high quality. Circuits are designed for studio quality performance and are engineered for extended service life. A FLAT-PAK module may be mounted right where its function is needed. 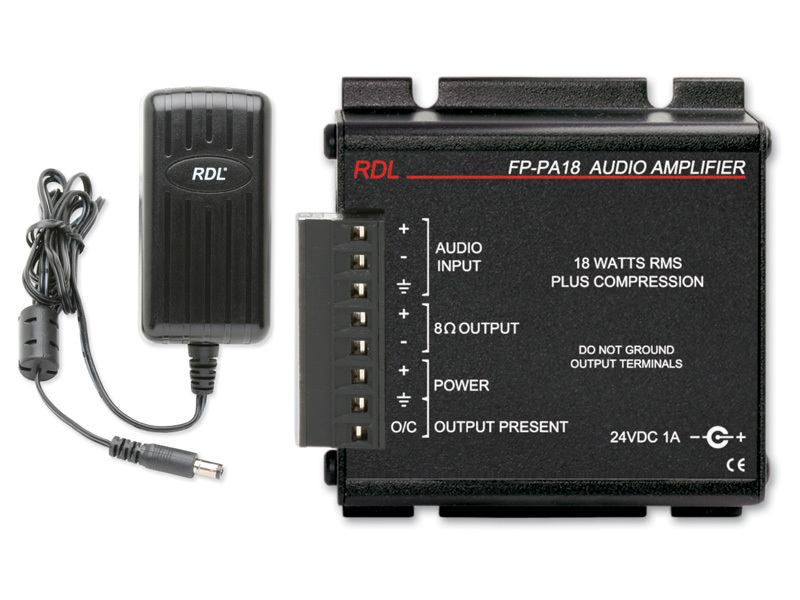 Multiple FLAT-PAK and other RDL modules can be used together to form all or part of an A/V system that precisely matches users’ needs. The high performance of these modules and the continuity in product offering and support makes FLAT-PAK modules a preferred long-term resource for system design solutions. FLAT-PAK SERIES modules are designed and manufactured in the U.S.A.